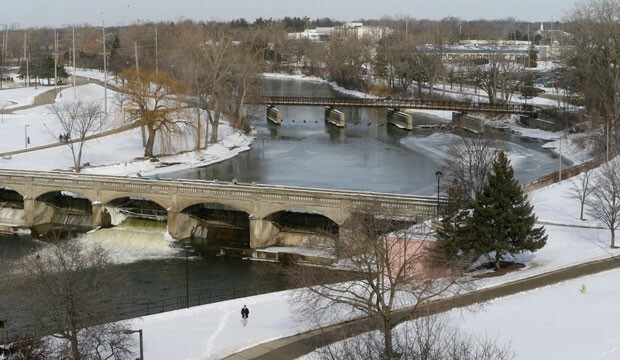 A view of the Flint River on February 18, 2016, in Flint, Michigan. Environmental racism and failing infrastructure have plagued communities of color for decades. The environmental justice movement seeks to rectify the problems created from these issues by ensuring the fair treatment of all people from different races, ethnicities, and incomes with the laws, regulations, and policies that affect their environment. The water contamination in Flint, Michigan, is just one window into the failures of infrastructure and environmental quality that have threatened communities across the country for generations. It has been more than 100 days since President Barack Obama declared a state of emergency due to the contaminated water in Flint. This column provides a snapshot of the environmental justice issues that communities of color across the country face every day. Communities of color have higher exposure rates to air pollution than their white, non-Hispanic counterparts. A Yale University study found that non-Hispanic whites had the lowest exposure rates for 11 of the 14 pollutants monitored in the study. Meanwhile, Hispanics had the highest exposure rates for 10 out of the 14 pollutants, and African Americans had higher exposure rates than whites for 13 out of the 14 pollutants. Some of the pollutants studied have been connected to asthma, cardiovascular issues, lung disease, and cancer. For example, a case study of The Bronx, New York, found that individuals who lived close to noxious industrial facilities and waste sites were 66 percent more likely to be hospitalized for asthma. Significantly, these same individuals were 13 percent more likely to be people of color. Landfills, hazardous waste sites, and other industrial facilities are most often located in communities of color. A report titled “Toxic Waste and Race at Twenty” reviewed data collected over a 20-year time period and found that more than half of the people who live within 1.86 miles of toxic waste facilities in the United States are people of color. A report by the Center for Effective Government found that people of color are nearly twice as likely as white residents to live within a fenceline zone of an industrial facility. These facilities contribute to air pollution, safety issues, and health concerns. Lead poisoning disproportionately affects children of color. Children of color who live in urban areas are at the highest risk for lead poisoning caused by lead-based paint. A studyby the Centers for Disease Control and Prevention determined that 11.2 percent of African American children and 4.0 percent of Mexican-American children are poisoned by lead, compared with 2.3 percent of white children. Lead poisoning can result in a wide range of health problems, such as anemia, seizures, and brain development issues. Even with the restrictions on lead paint usage, children of color who live in low-income communities continue to suffer the most. For example, a 2004 report revealed that African American children and Hispanic children in Chicago were 12 times and 5 times more likely to be poisoned, respectively, than white children. Climate change disproportionately affects low-income communities and communities of color. The effects of climate change, such as extreme weather conditions, have devastating consequences for communities of color and low-income communities. These extreme weather events can displace residents and even cause death. In the aftermath of such disasters, efforts of city officials to rebuild communities of color and low-income communities are often inadequate compared to efforts to rebuild higher-income and white communities. Perhaps the most powerful example of this inequity is the communities of color in New Orleans that were affected by Hurricane Katrina. Black homeowners received $8,000 less in government aid than white homeowners due to disparities in housing values. In 2013, about 80 percent of the mostly black residents of the city’s Lower 9th Ward had not returned to their community due to inadequate building efforts. Water contamination plagues low-income areas and communities of color across the nation. Studies have documented limited access to clean water in low-income communities of color. Water contamination has largely affected children of color who live in rural areas, indigenous communities, and migrant farmworker communities. Contaminated water can cause an abundance of health-related issues, particularly for young children. Depending on the contaminant, possible health problems can include waterborne diseases, blood disorders, and cancer. Indigenous people of the Navajo Nation, for example, have suffered for years from water contamination due in part to the residual effects of uranium mining in the region during the 1950s, as well as the recent Gold King Mine toxic spill. In St. Joseph, Louisiana, residents are forced to live on water that is tinted brown and yellow but that the state continues to claim is safe to drink. African Americans make up three-quarters of the town’s population and nearly 40 percent of the residents live in poverty. Decades of studies have proven that environmental racism is a threat to the health and overall safety of communities across the country. But this is not a problem without a solution. Indeed, policymakers already have the tools to address this injustice and to develop policies with communities of color in mind. Effective environmental justice policies should safeguard communities as places where all people can live, work, and play without fear of exposure to toxic, deadly surroundings. As people of color come to make up a majority of the population, environmental justice issues should be prioritized as national issues, not one-off problems siloed in cities with significant populations of color, such as Flint, Michigan. Jasmine Bell is an intern with the Progress 2050 team at the Center for American Progress.